This recipe was submitted by Rebecca L.Thornton, C.H.N., Holistic Nutritionist, RYT Yoga Instructor registered with Yoga Alliance. Soup again? …But, of course. Soup in the fall and winter is the BEST, we’d even go as far to say better than salads (although salads are still warranted, from time to time). We totally heart soups because you can do anything with them, make them light, make them creamy, add meat, go vegan, just really anything. But the best thing to do with soups (especially if you’re into that whole health thing, wink wink) is load in VEGGIES. That’s what great about them, you can add in so many veggies without feeling like you’re eating a boring bowl of plain old veggies. You can even add in veggies that you don’t normally eat, or like, and then blend them together to soften the taste. An amazing way to get in your greens, your onions, your mushrooms, your… whatever vegetables you would rather not with. 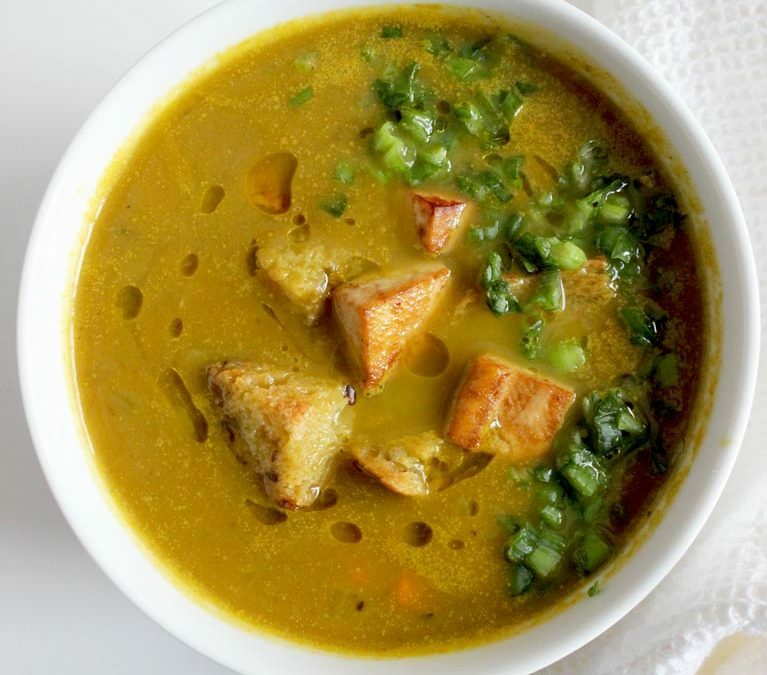 So, thanks to our recipe contributor Rebecca, this Winter Squash, Leek And Vegetable Soup With Tofu Croutons is completely loaded with vegetables, but still undeniably delicious. You have leeks, which are in the allium family, and incredibly high in sulfur containing nutrients (the beauty mineral, you know?) And, winter/ butternut squash, which contain a unique mix of antioxidants, including Vitamin C, making it a wonderful fall and winter food if you’re looking to boost your immune system. We’re all for this winter soup, it’s definitely a staple in our kitchen, and something that you can add more variety of veggies to, or keep it simple and easy. We pureed half the soup, and left the other half chunky to get a variety of texture, but that’s the beauty of soup, you can do whatever suits you best! 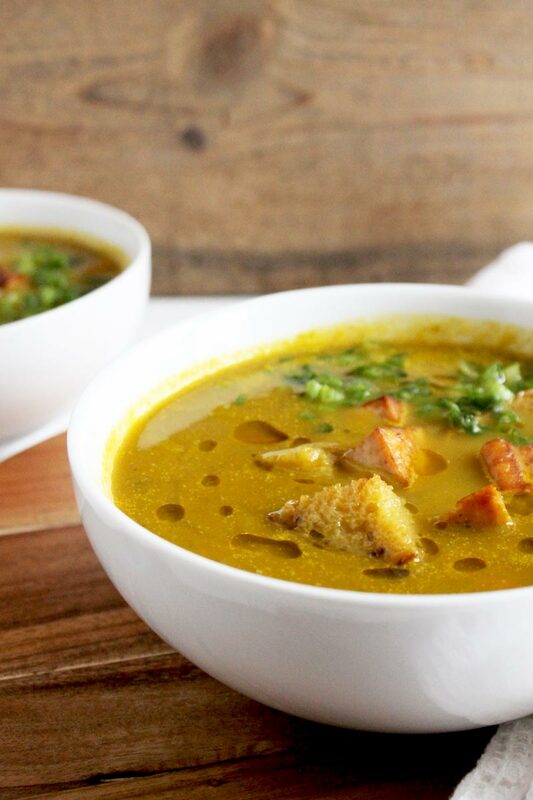 You’re going to want to get in on this soup today (especially if you’re not really digging the winter temps). So, this recipe is totally great for your bod’, not going to lie, but you might be wondering how else you can incorporate awesome foods to your lifestyle without dieting. We’ve designed a free Diet Review Quiz that examines your current diet and gives you realistic strategies to help turn your ‘diet’ into a lifestyle with little to no effort. Take the Quiz today and let us show you how to make this whole healthy way of living stick, for good. 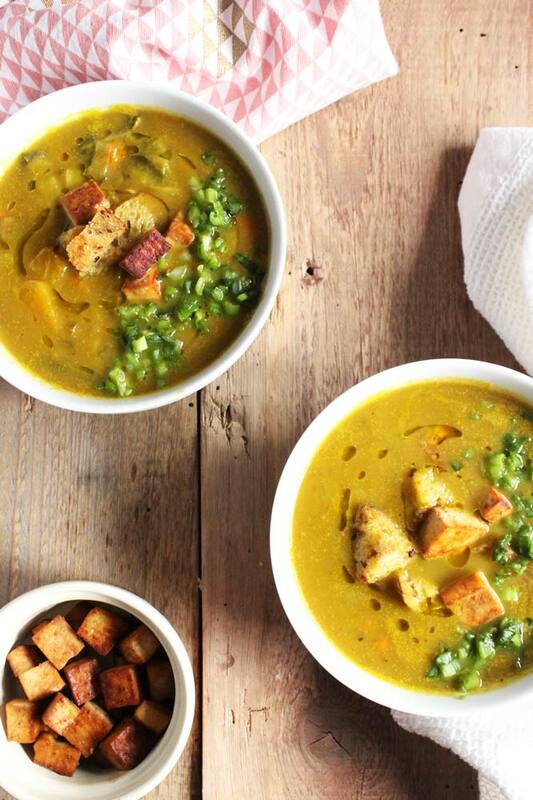 Have you tried this warming winter soup yet? Comment below we would love to hear your review! 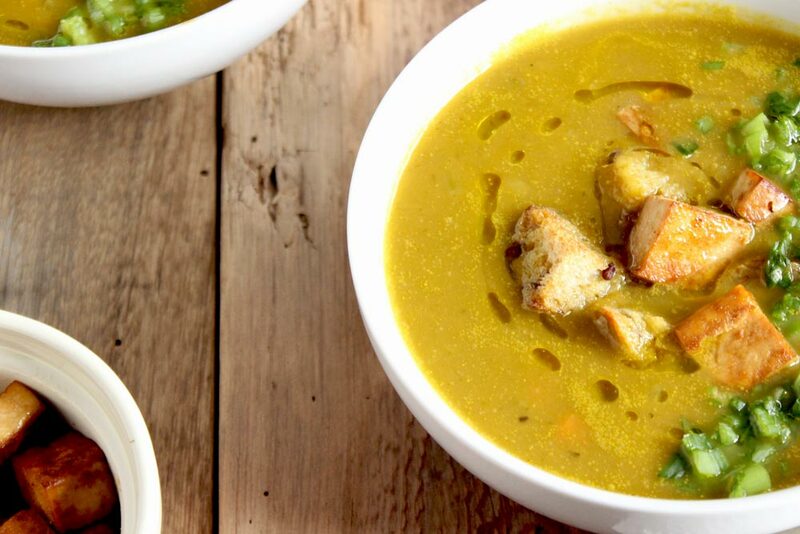 This hearty and healthy winter inspired soup is jam packed with nutrients that will give your immune system a little boost, even on the coldest of winter days. In a stock pot slightly saute the onion, garlic, leek, carrots celery with minimal oil on low heat 3-4 min. Add the cubed squash, shiitake mushroom, broth and turn to medium heat for 30 mins or when the squash is soft. Add the spinach at this point. 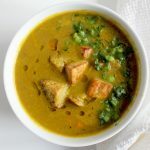 While the soup is on slice a sprouted tofu block into 1 cm cubes, place them on a baking sheet and drizzle them with olive oil, herbs, and a pinch of sea salt or tamari. Bake these at 350 for 20mins. When the soup is thoroughly cooked, you can either keep this with broth and vegetable chunks, or choose to puree the whole soup, or half the soup. Our style is half pureed, half chunky. Add croutons to the soup when serving. We used an entire pack of dried chanterelle mushrooms and added some sage and thyme for an earthier taste. 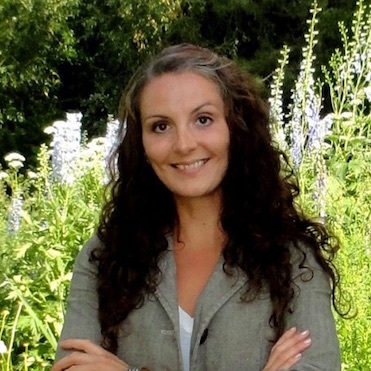 Rebecca L.Thornton, C.H.N., Holistic Nutritionist, RYT Yoga Instructor registered with Yoga Alliance. Owner and Creator of Wild Seed Holistic Health Ltd. in Calgary Alberta, I can’t think of anything that is more important in life than our health and happiness and that is why I’m so passionate about inspiring my clients to take their own health and happiness to the next level. I am a self-confessed food geek and I love researching and finding ways to integrate nutrition, lifestyle, and mindful choices into practical, easy habits for our busy lives. Visit Wild Seed Holistic Health here, or follow her on Facebook here. Delicious. In Mexico and added sweet potato and a local squash, yum!